Warm greetings from our snowy Highlands landscape, where we work away in our stone-walled studio on filming tutorials, Paul's work as a Fine Artist and most particularly the ever-growing mammoth of our project, the 'Elphen Chronicles'. We awoke on Thursday morning to find our world transformed overnight by the first fall of snow this winter. Autumn had not quite completed its transformation, with many of the trees in our garden still bearing green leaves. A magical view of red-infused branches, trunks dripping with lichen, yellow whin flowers, rich-russets of the copper beech hedges, our frozen pond, all brilliantly set against a sea of white. To borrow a phrase from our lovely friend Liza Mulholland (our Music Director/Producer on Elphen Chronicles), we could not help but “Stand and Stare” at Nature’s beauty. Although we could happily spend every hour in the haven of our studio, we do venture forth to spend time with fellow creators and, on Wednesday, left our ‘nest’ for a wee while, motoring off to Inverness to join Liza for an unforgettable afternoon. Liza had more ideas for the Elphen soundscape, which she wished to discuss with us; most particularly the music to accompany Chapters 1 to 3 of the video-book version of ‘Webstrand, the Tooth Gatherer’ (there are nine chapters in total). But more of that in the weeks to come, when we finish making the film of this joyous session, the second in our behind-the-scenes peek into the composing and recording of the Elphen soundscape, which we will be sharing it with everyone as another of our free-to-view Bonus Feature films. Some weeks ago the two of us also ventured out to the weaving shed and workshop of Textile Artist, Ruth Black. Ruth is ‘spinning’ her magic on a number of Elphen surprises and for this visit she was going to take us through her work on Paul’s ‘Elphen’ story-telling waistcoat. 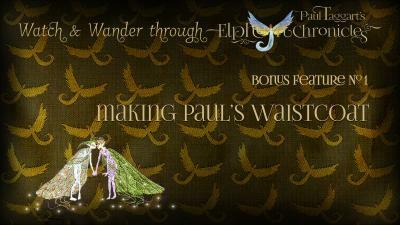 Well .... we simply couldn’t pass over the opportunity to do something that little bit extra for Paul’s Elphen waistcoat, especially for the video-book version and for possible tours in the future. “Painting with thread” is how we refer to Ruth’s artistry; as you will hear, in this FREE-TO-VIEW Bonus Feature film, in which we share with you the thought, care and attention that has gone into creating this very special item. Ruth’s skill as a textile artist, her ability to exploit and maximise threads, cannot help but fascinate (in much the same way an artist exploits and maximises brushes and paint). We are thrilled with how Ruth interpreted Sunita’s design for the waistcoat and the various ideas we’re collectively working on. Her realisation of the original watercolour painting of the ‘Kissing Elphen’, rendered in detailed embroidery, went beyond what we dared hope-for. You will see surface-mixing in action as she brings the Elphen wings to life, they seem to breathe and flutter across the front panels of the waistcoat. Fluid borders that grace each page of the book, originally painted in oils, shimmer in silken threads along the placket of Paul’s top pocket – these too are crucial motifs in the story. All finished off to perfection, stitched onto an ‘Elphen’-blue silk, the waistcoat since then completed and made-up, with our uniquely commissioned and woven ‘Elphen’ lining. Everyone following our start-to-finish filming of the book jacket Masterworks oil painting should have received their update message from Vimeo of the fact that we have now added another three episodes. We have also filmed a status up-date as a revised trailer for this set of videos; so if you would like to be introduced to another couple of Paul’s large Masterworks oil paintings, then do pop over and have a look-see at that, Previous up-dates now appear as FREE-TO-VIEW Bonus Features on this ‘Watch & Wander through the Elphen Chronicles by Paul Taggart’ series. We are having the times of our lives working on ‘Webstrand, the Tooth Gatherer’ the second book in Paul’s ‘Elphen Chronicles’. The joy of inviting other creators to work with us, talented in their particular field, makes this project even more unique. Collaboration is truly about working together, for a common goal, that of seeing something come to life through the creative process of thought, design, execution and finish. Collectively we are aiming to keep traditional artistry alive through our work, which forms the basis of what we seek to do on Paul’s ‘Elphen Chronicles’ – although modern technology plays its pivotal role, for without it we simply wouldn’t be able to execute another of our aims – which is to share, as much as we can, those processes in the films we make. We do hope you don’t mind us keeping in touch, for in the not too distant future we will also be sharing with you some FREE-TO-VIEW tutorials, dedicated to the various processes used in this body of work – kicking off with a stand-alone painting workshop from Paul.